Our enterprise Ala Soevabrik fully owns and operates 3 charcoal factories in Estonia: 2 charcoal manufacturing facilities in Valga and Jarvamaa area and the 3rd factory - in Nurga, Poltsamaa. 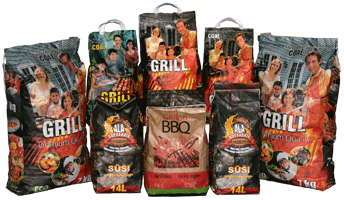 We pack the charcoal bags at our central warehouse facility that operates since 2001. The high quality charcoal is made from alder. We employ authentic Dutch charcoal manufacturing technology producing our products in continuous-action furnaces. Our state-of-the-art packaging lines feature product crushing management and custom dosage per packaging container. That allows for fully custom production of customer-preferred container sizes filled with high quality charcoal with no dust or smaller charcoal particles. The total manufacturing capacity of our three factories and central warehouse is at the level of 200 tons of coal per month with room for expansion. Our selected bag designs feature handles for comfortable use. All our bag designs feature an imprinted manual in 15 languages. All our charcoal finished products are EU-certified. We successfully compete with ten other businesses in Estonia at Baltic States charcoal marketplace. One of the most popular Estonian periodic publications, daily paper "Ohtuleht", featured our charcoal products as "the most favorite" among consumers. Ala Söevabrik OÜ © 2012 | All rights reserved.